The Greens are certain to increase their local government representation after yesterday’s successful council elections. With many votes still to be counted, the Greens already look likely to win 29 council positions this election and are in a strong position to win an additional 5 positions. Out of the councils that voted, the Greens had 11 sitting councillors and 11 more from councils sacked by the Liberals in newly amalgamated councils. The Greens strong growth is despite a smaller pool of council positions due to the amalgamated councils across Sydney. “The Greens had an outstanding result in these elections and this is great news for residents who want councillors who represent them and not developers. 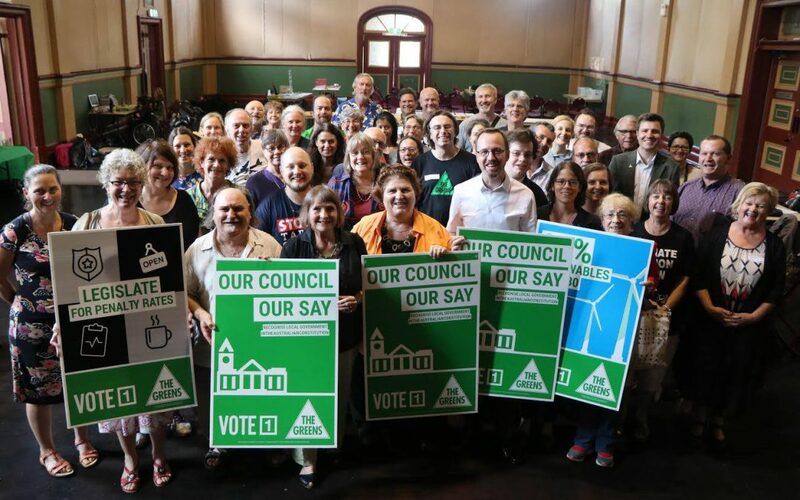 ”With fewer council positions up for election the Greens have returned even more councillors all across NSW from Waverley to Wollongong and Queanbeyan to the Inner West. “Yesterday saw Inner West residents reject the Liberal party and they look set to send 5 Greens councillors to the newly amalgamated council. “In Waverley a record 3 Greens councillors form part of a non-Liberal majority that will save Bondi Pavilion and oust unpopular Liberal Mayor Sally Betts. “In Parramatta the Greens are a strong chance for our first Councillor and in Hornsby at least two and possibly three Greens Councillors are heading to Town Hall. “Across regional NSW the Greens are likely to have added councillors on Snowy Monaro, Bathurst, Orange, Queanbeyan-Palerang and Armidale Councils. “This election has seen local communities responding to the Greens NSW grassroots policies and our strong record of putting residents before developers. “NSW has seen through the ugly politics of forced amalgamations, privatisation and overdevelopment being pushed by the Liberal government and demanded change,” Mr Shoebridge said.